Bangladesh Specialized Hospital job circular 2018 has been published by Athority. Bangladesh Specialized Hospital is the most important department in our Bank. To get Bangladesh Specialized Hospital job circular 2018 related all information, Read this article. Bangladesh Specialized Hospital has all the characteristics of a world-class hospital with wide range of services and specialists, equipment’s and technology, ambience and service quality. The hospital is a showcase of synergy of medical technology and advances in ICT Division through paperless medical records. The skilled nurses, technologists and administrators of Bangladesh Specialized Hospital, aided by state-of-the-art equipment’s, provide a congenial infrastructure for the medical professionals in providing healthcare of international standards. Educational Qualification: Post Graduate Degree/Diploma. Experience: Specialist- 1-2 years, Registrar- 5 years and Senior Medical Officer- 3 years’ experience. Educational Qualification: As per as Circular. Other qualifications: As per as Circular. Experience: As per as Circular. 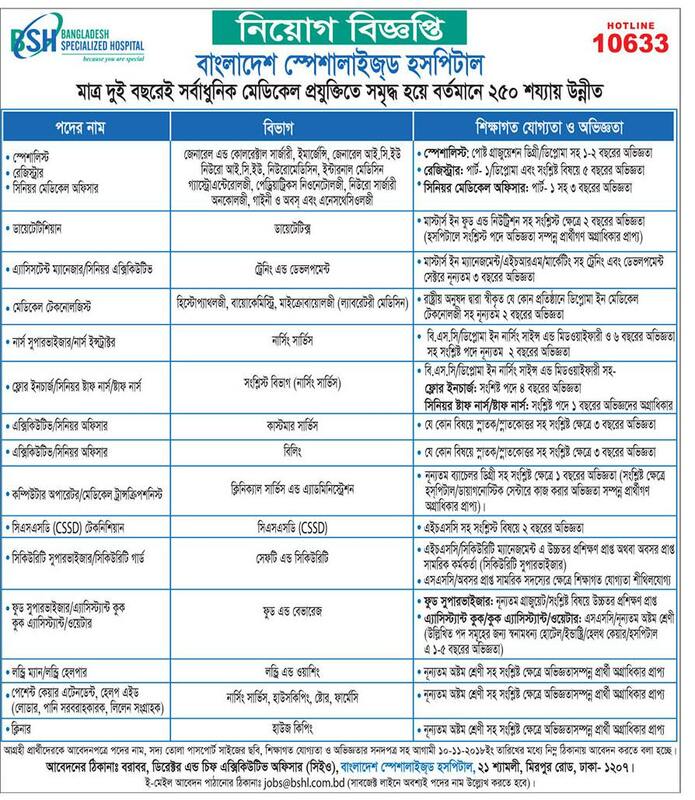 Application Rules: Director and Chief Executive Officer (CEO) Bangladesh Specialized Hospital, 21 Shamoly, Mirpur Road, Dhaka-1207 or Email send to jobs@bshl.com.bd. Application deadline: Interested candidates will be able to apply till 10 November 2018. This page related to: Bangladesh Specialized Hospital, Bangladesh Specialized Hospital job, Hospital Job.